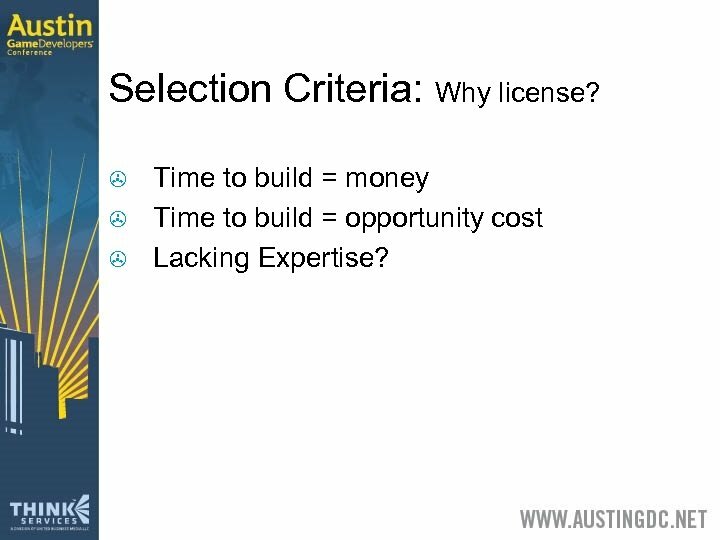 Selection Criteria: Why license? 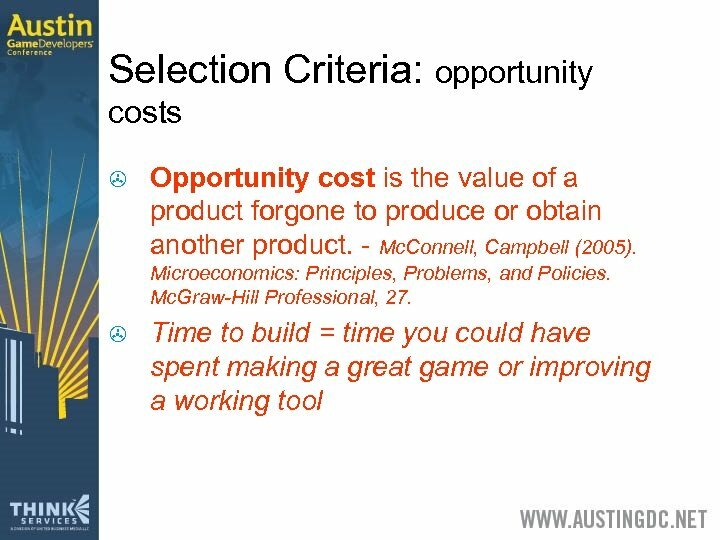 > > > Time to build = money Time to build = opportunity cost Lacking Expertise? 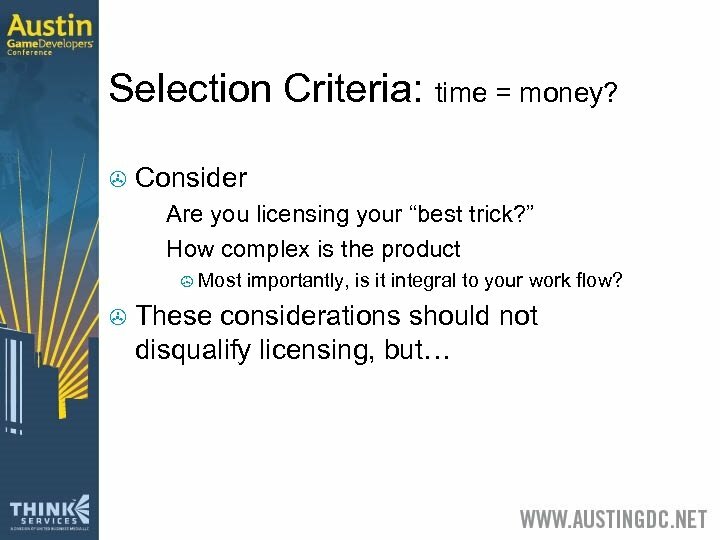 Selection Criteria: choose wisely > > By this point you have committed to licensing something. 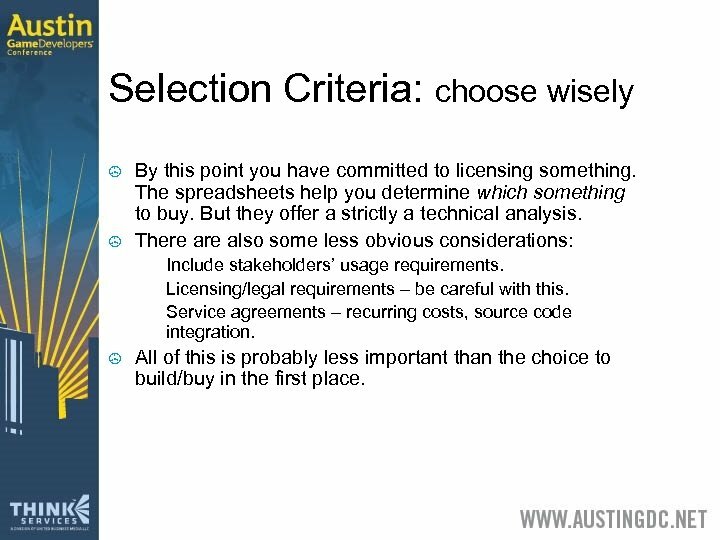 The spreadsheets help you determine which something to buy. But they offer a strictly a technical analysis. There also some less obvious considerations: > > Include stakeholders’ usage requirements. 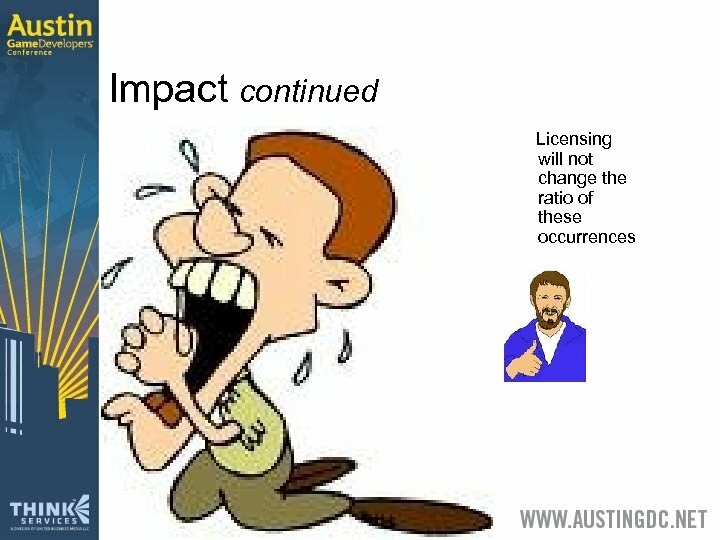 Licensing/legal requirements – be careful with this. Service agreements – recurring costs, source code integration. All of this is probably less important than the choice to build/buy in the first place. 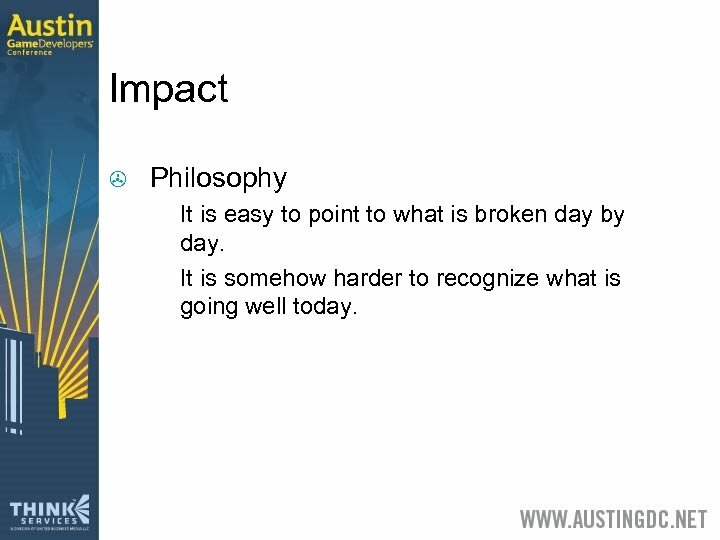 Impact > Philosophy > > It is easy to point to what is broken day by day. It is somehow harder to recognize what is going well today. 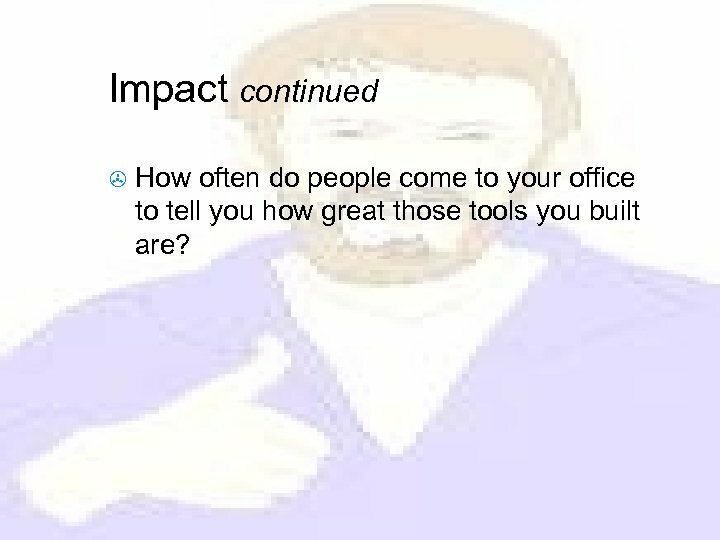 Impact continued > How often do people come to your office to tell you how great those tools you built are? 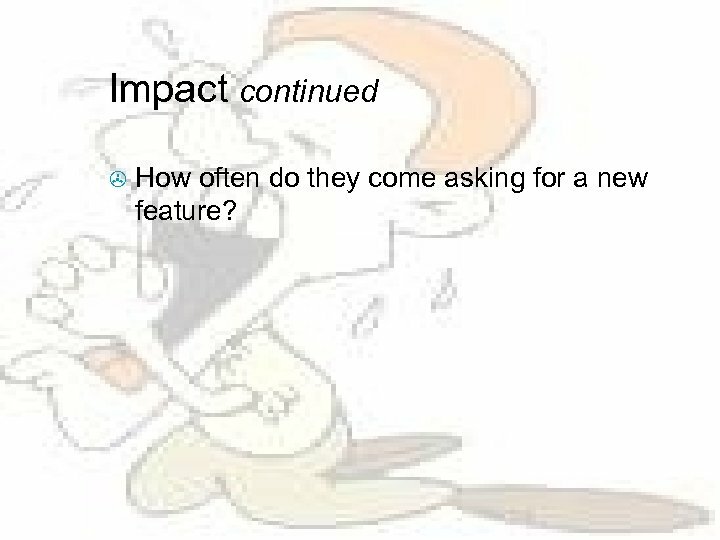 Impact continued > How often do they come asking for a new feature? 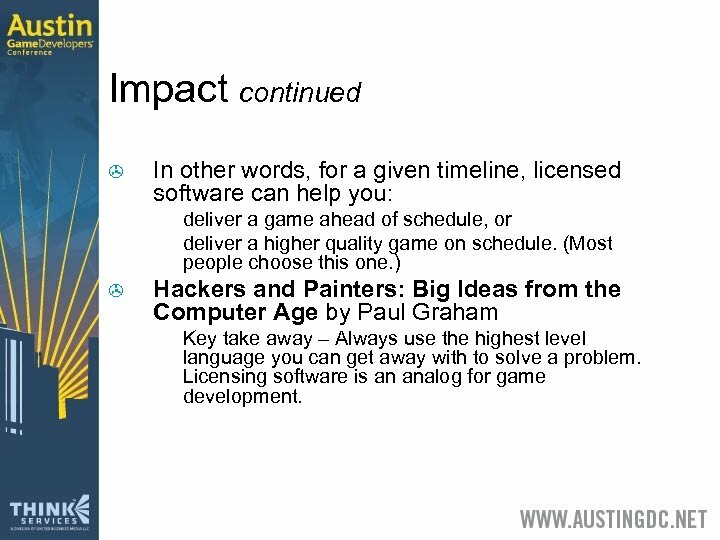 Impact continued > In other words, for a given timeline, licensed software can help you: > > > deliver a game ahead of schedule, or deliver a higher quality game on schedule. (Most people choose this one. ) Hackers and Painters: Big Ideas from the Computer Age by Paul Graham > Key take away – Always use the highest level language you can get away with to solve a problem. 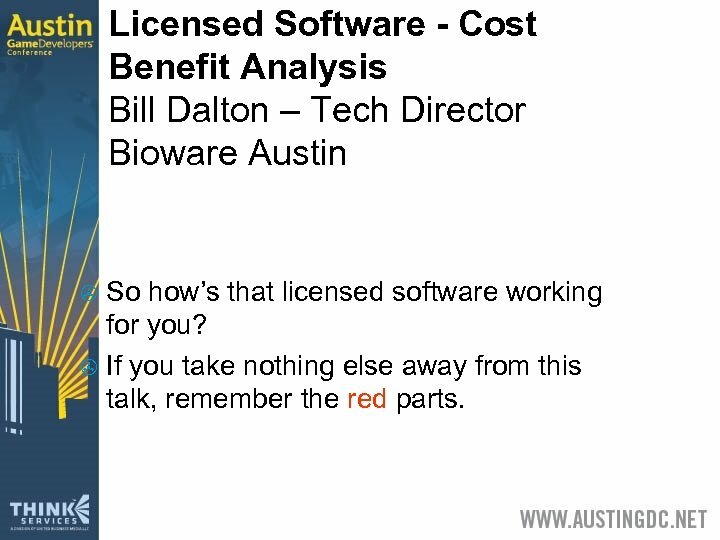 Licensing software is an analog for game development. 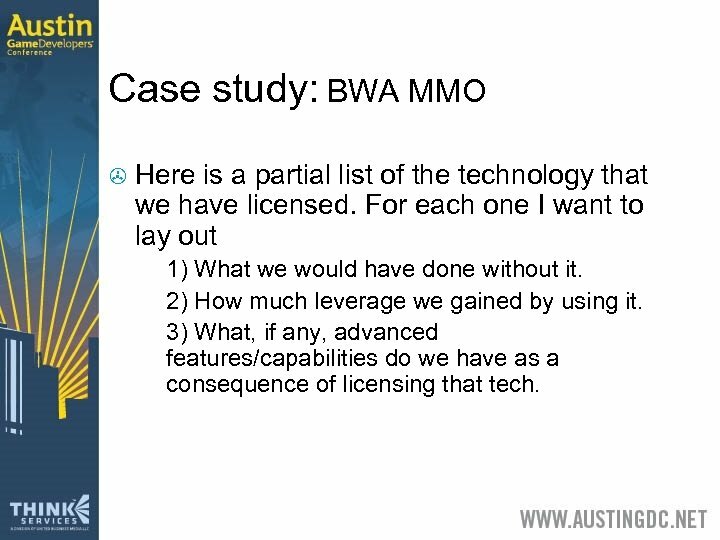 Case study: BWA MMO continued > d. PVS (Umbra Software) > Without d. PVS > > Leverage > > Very efficient, gives us headroom for other things. Advanced features enabled > > Write our own visibility system. Nothing specific. Conclusion > No brainer. Very narrow focus. Just plug it in. It works. 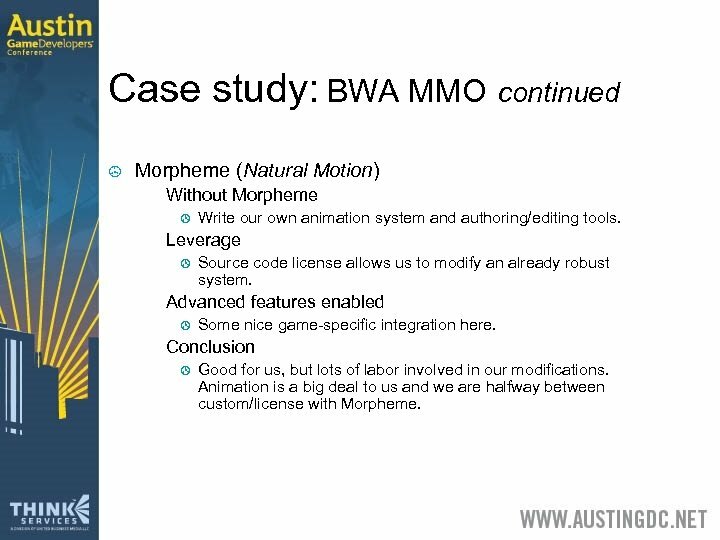 Case study: BWA MMO continued > Morpheme (Natural Motion) > Without Morpheme > > Leverage > > Source code license allows us to modify an already robust system. Advanced features enabled > > Write our own animation system and authoring/editing tools. Some nice game-specific integration here. Conclusion > Good for us, but lots of labor involved in our modifications. Animation is a big deal to us and we are halfway between custom/license with Morpheme. 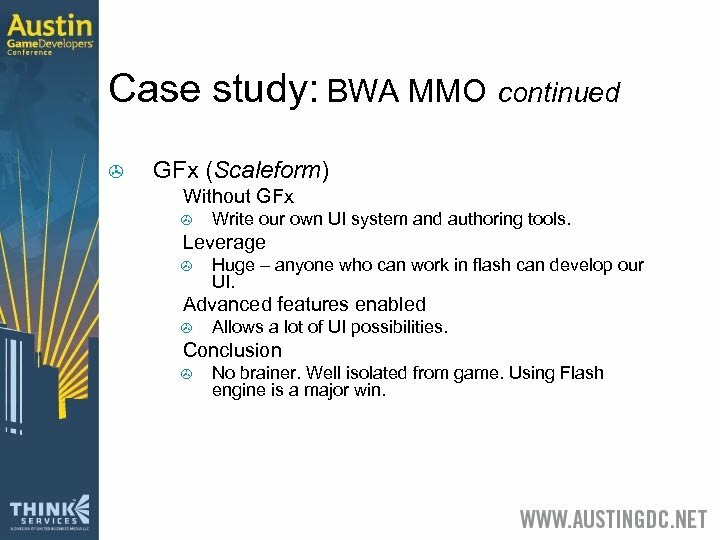 Case study: BWA MMO continued > GFx (Scaleform) > Without GFx > > Leverage > > Huge – anyone who can work in flash can develop our UI. Advanced features enabled > > Write our own UI system and authoring tools. Allows a lot of UI possibilities. Conclusion > No brainer. Well isolated from game. Using Flash engine is a major win. Case study: BWA MMO continued > Kynapse (Autodesk) > Without GFx > > Leverage > > > Sophisticated tools to analyze terrain/levels. Frees up content developers that would have been placing nodes etc. Advanced features enabled > > Write our own AI pathing system and authoring tools. Full AI solution – comes with a lot of interesting canned functionality that I doubt we would have developed on our own. Conclusion > > No brainer. Easiest possible workflow once integrated. 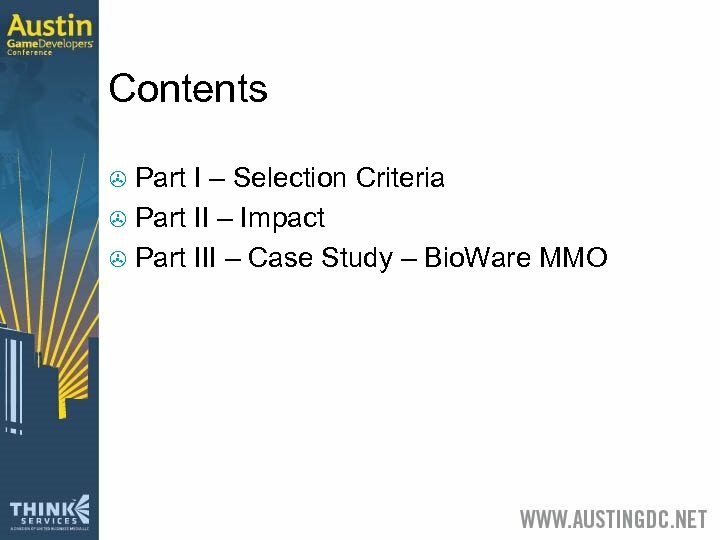 Extremely nice performance characteristics for MMO. 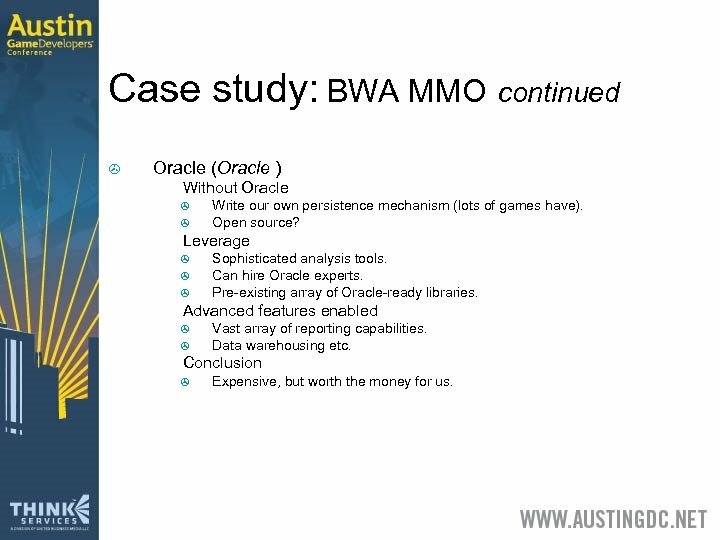 Case study: BWA MMO continued > Oracle (Oracle ) > Without Oracle > > > Leverage > > Sophisticated analysis tools. Can hire Oracle experts. Pre-existing array of Oracle-ready libraries. 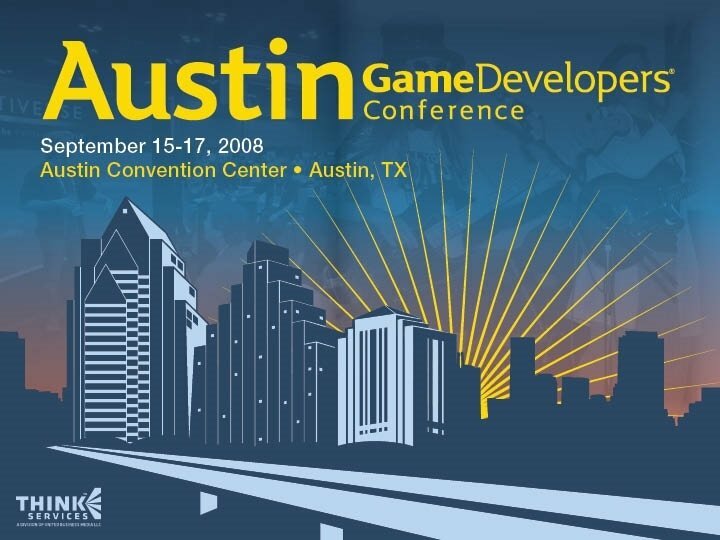 Advanced features enabled > > > Write our own persistence mechanism (lots of games have). Open source? Vast array of reporting capabilities. Data warehousing etc. 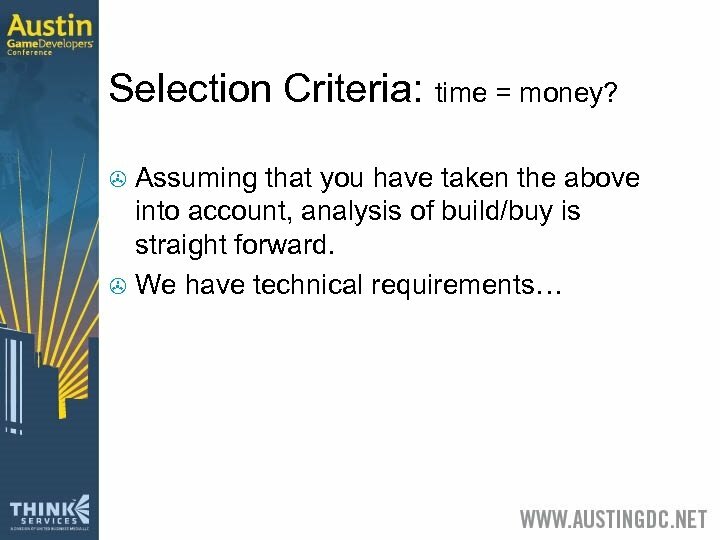 Conclusion > Expensive, but worth the money for us. 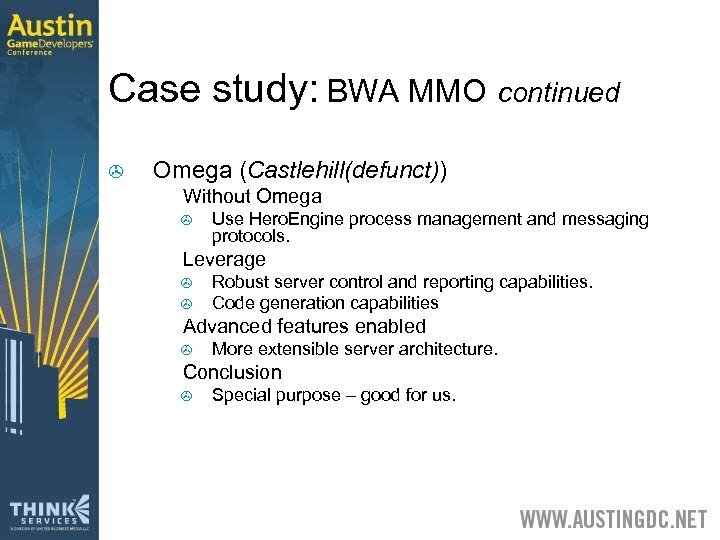 Case study: BWA MMO continued > Omega (Castlehill(defunct)) > Without Omega > > Leverage > > > Robust server control and reporting capabilities. Code generation capabilities Advanced features enabled > > Use Hero. Engine process management and messaging protocols. More extensible server architecture. Conclusion > Special purpose – good for us. 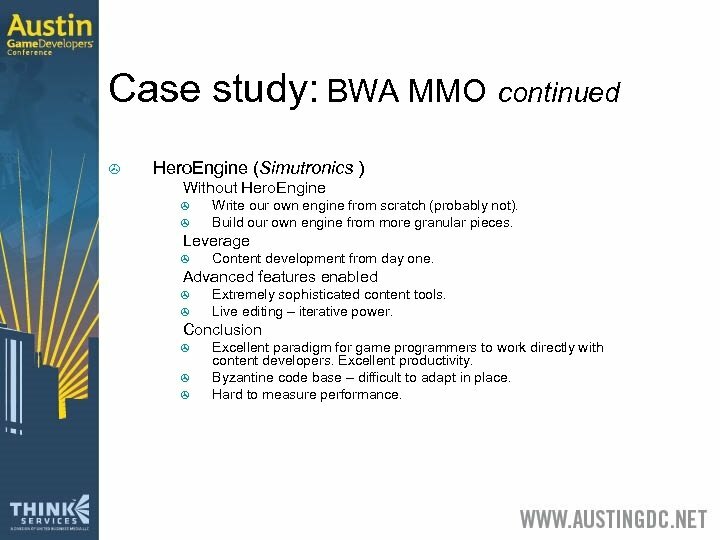 Case study: BWA MMO continued > Hero. Engine (Simutronics ) > Without Hero. Engine > > > Leverage > > Content development from day one. Advanced features enabled > > > Write our own engine from scratch (probably not). Build our own engine from more granular pieces. Extremely sophisticated content tools. 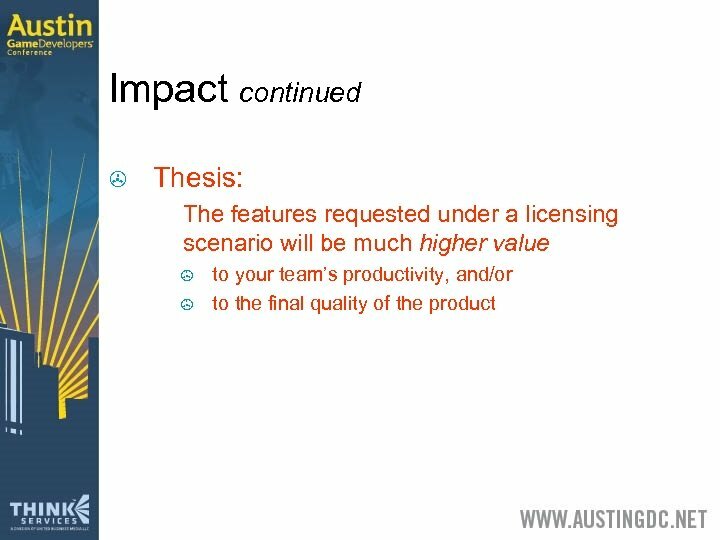 Live editing – iterative power. 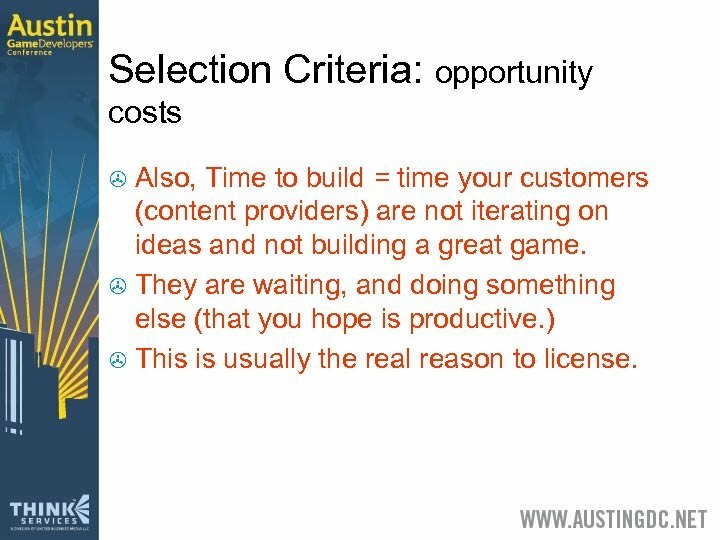 Conclusion > > > Excellent paradigm for game programmers to work directly with content developers. Excellent productivity. Byzantine code base – difficult to adapt in place. Hard to measure performance. 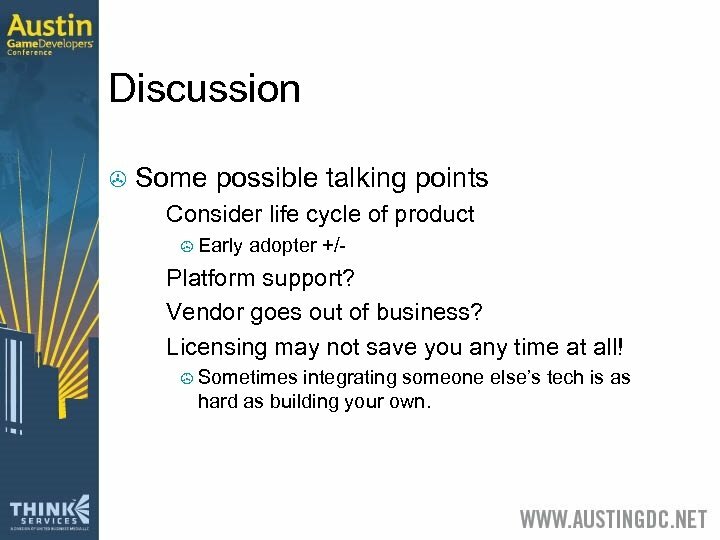 Discussion > Some possible talking points > Consider life cycle of product > Early adopter +/- Platform support? > Vendor goes out of business? 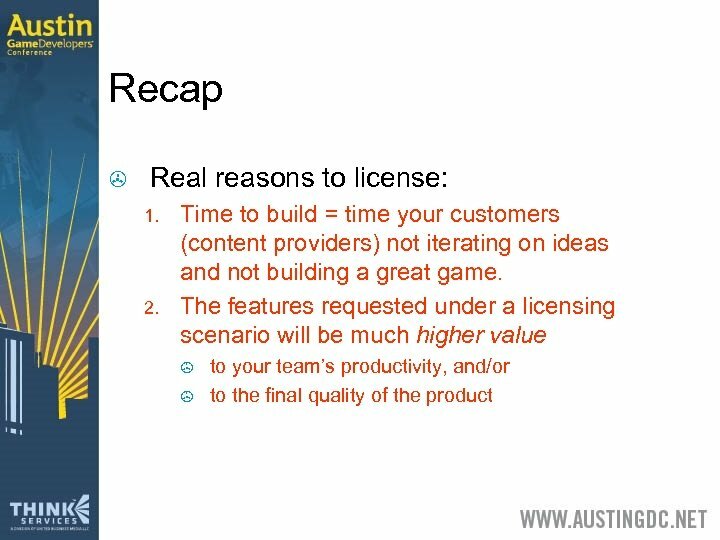 > Licensing may not save you any time at all! > > Sometimes integrating someone else’s tech is as hard as building your own.